Even though some counties did increase the 1-unit loan limit, the max loan for any conforming loan is $417,000. Any amount over $417,000 up to the max county high-cost loan limit is considered a High Balance conforming loan. Any amount over the High Balance limit is considered Jumbo financing. What Loans Are Covered Under Conforming? All conventional loans by way of Fannie Mae and Freddie Mac have to stay within these loan limits. In addition VA also follows these loan amounts. Even though VA does not have a maximum loan limit you are still required to pay 25% of the difference between the county loan limit and the purchase price. Who Sets The Conforming Loan Limits and How Do They Determine What They Will Be? The Housing and Economic Recovery Act of 2008 (HERA) created a formula to determine what the max loan limit should be for each county. Each year the loan limits are based on the median home prices from October to October reported by the Federal Housing Administration (FHFA). By law Fannie Mae and Freddie Mac cannot exceed the loan limits. What is a High Balance Conforming Loan? Some counties have higher median home prices that are considered high-cost areas. Through various legislative acts FHFA is able to increase loan limits in certain high-cost areas around the United States. Basically, it just means that the loan amount exceeds the max conforming loan limit of $417,000 but is still below the high cost loan limit for that county. Keep in mind that you may have a slightly higher interest rate with High Balance loan amounts. What If My Loan Balance is Over The Conforming or High Balance Loan Amount? If your loan balance is over the loan limit for that particular county your loan is considered a non-conforming loan or more commonly known as a Jumbo loan. With a jumbo loan you will have a different set of qualifying conditions you will need to meet. For instance a larger minimum down payment, interest rate may be higher, credit score requirements are different and reserve requirements are different. The main reason is that jumbo loans are a higher risk to lenders and banks, so they require a bit more to reduce their lending risk. Call or email if you have any Questions about Conforming Loans or Loan Amounts. Want to get pre-approved for a Colorado Conforming loan? Click here to start. As of January 1st, 2015 VA loan limits will be the same as Conforming loan limits based on the median home values for a particular area per the Federal Housing Finance Agency (FHFA). VA allows loans on one-unit to four-unit properties, but the one-unit max loan limit applies to all properties regardless if it is one to four-units. For 2015 most of the loan limits in Colorado have stayed the same, but 12 counties have been reduced and only Boulder County increased from 2014. In a county where the loan limit decreased, VA will honor the previous higher limit on a purchase as long as the sales contract was signed by all parties and the buyers loan application were all done prior to Jan 1st, 2015. In the 2015 Colorado VA County Loan Limit chart below you will see all loan limits for every county in Colorado. Plus the loan limit differences from 2014 to 2015. The max loan limit can be a bit deceiving because VA does not have an actual maximum loan amount. The max loan limit does represent the max VA loan you can receive with a zero down payment depending on your remaining VA entitlement. Since VA does not have a max loan amount, you can get a loan above the max county loan limit. However, you have to put down a minimum down payment for 25% of the difference between the county limit and the purchase price. Let’s say you’re purchasing a home for $450,000 in Weld County where the loan limit is $417,000. With enough available entitlement VA will guarantee a loan up to 25% of the max county loan limit, enough to get a $417,000 loan at 100% financing. The difference between $450,000 and $417,000 is $33,000. The buyer would have to bring in 25% of the $33,000 for $8,250. *Keep in mind if there is a VA funding fee attached to the loan, the buyer would have to bring in 25% of that funding fee as well since it is added to the mortgage balance. If a Veteran has previously used entitlement that has not been restored, the maximum guaranty amount available to that Veteran must be reduced accordingly. 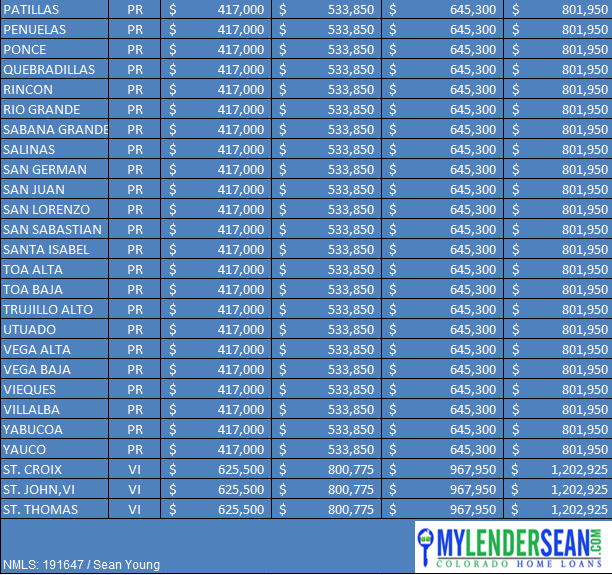 In the below 2015 VA Colorado Loan Limit chart you will see a list of all the high-cost areas and their max loan limits. The VA loan guarantee is never guarantee to lend. It is only to offset the lenders risk in case of default. All borrowers still have to qualify for all VA home loans. FHA said loan limits for the highest cost areas of $625,500 and the lowest cost areas at $271,050 will remain unchanged. No County will see a decrease this year. In fact Colorado received 12 county loan limit increases for 2015. The FHA loan limit in each county is determined by a number of factors based on a percentage of the national conforming loan limit. FHA’s minimum national loan limit (the floor) is 65% of the national conforming loan limit. The minimum limit applies to those areas where 115 percent of the median home price is less than 65% of the national conforming loan limit of $417,000 for a one-unit property. 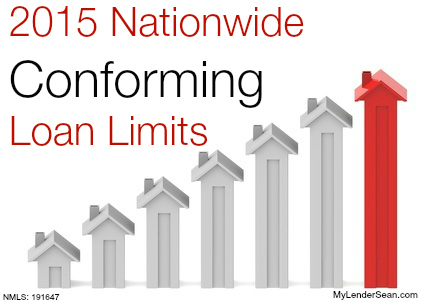 The loan limit ceiling is at 150% of the national conforming loan limit. the maximum loan limit (ceiling) applies to areas where 115% of the median home exceeds 150% of the conforming loan limit. Below is the 2015 FHA Colorado County Loan Limit Chart. Numbers marked in yellow show the counties that received the increase. For loan amounts above $417,000 but still below the max county loan limit you might be priced as a high-balance loan. The chart below compares the 2014 vs. 2015 FHA Colorado County Loan Limits.